The United Nations World Geospatial Information Congress (UN WGIC) was held in Deqing, Zhejiang Province, China 19-21 November 2018. The event was convened by UN through the Department of Economic and Social Affairs, with support of the government of China though the Ministry of Natural resources and the Zhejiang Provincial Government. The congress theme was “The Geospatial Way to a Better World” and attracted over 200 invited presentations that were delivered through four plenary sessions, 36 themed sessions and 4 special sessions. It was estimated that there were 1400 delegates comprising of 800 international and 600 Chinese participants. Geospatial and location enablement to be recognised as underpinning foundation data. Overall the content and quality of the presentations at the UN WGIC sessions relating to “Growing Global Geospatial Capability and Capacity” were of a respectable standard. The sessions however may have had more interaction from delegates and impact if additional time was provided for in-depth case studies to demonstrate (a) the challenges and achievements in greater detail and (b) the implementation of geospatial principles or strategies various frameworks. The highlight session for FIG APCDN was “Operationalizing the UN Integrated Geospatial Information Framework”. In this session, there were several operational case studies that utilised the framework, several overviews of the framework and its strategies, a concise and meaningful presentation by the World Bank about its role in assisting with implementation, and a thoughtful summary about the importance of delivering an outcome for such projects. To review the above, other UN WGIC presentations, and the Moganshan Declaration - "The Geospatial Way to a Better World" please check the website -http://ggim.un.org/unwgic/ . 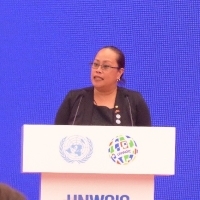 It was also very pleasing to see at the UN WGIC the active participation of the Pacific Geospatial Survey Council (PGSC) and their members from Fiji and Tonga. The PGSC Chair Ms Rosamond Bing and Vice Chair Ms Ms Meizyanne Hicks we very noticeable at several geospatial information framework and policy forums, as well as Mr Viliami Folau at numerous geodetic or capacity building sessions and meetings. 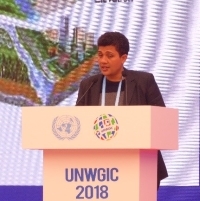 The UN WGIC also attracted almost 200 exhibitors that showcased the latest geospatial information technologies such as aerospace remote sensing, artificial intelligence systems and applications, IT systems to support smart cities, government and administration, and the usual surveying and GIS equipment and systems. It was estimated that two thirds of exhibitors were Chinese based organisations and the remainder international. The exhibition was displayed in 3 halls that covered an area of 13000 sqm. The Regional Committee of UN Global Geospatial Information Management Asia Pacific (UN GGIM AP) convened their 7th Plenary Meeting in Deqing as well. Due to FIG AP CDN recent and effective collaboration with the UN GGIM AP, an invitation to this event was provided. At this meeting the UN GGIM AP members attended to normal business and administrative matters, which included annual reports from each of the UN GGIM AP working groups - Geodetic Reference Frame; Disaster Risk Management; Regional Spatial Data Infrastructures; and Cadastre and Land Management. For the 2015-18 term the UN GGIM AP Geodetic Reference Frame working group, FIG AP CDN and FIG Commission 5 have made progress to improve geodetic infrastructure, systems and capability in the Asia Pacific region. More importantly they have established a network of willing people and organisations to further build geodetic knowledge, to share experiences and exchange ideas in a collaborative manner. Furthermore because of this relationship and the accomplishments to date, it is strongly suggested that other FIG Commissions and Networks continue working with like-minded organisations and to explore more opportunities to collaborate with the UN GGIM and its affiliations to achieve the FIG vision of enhancing our profession through ongoing development of our surveyors. In saying that FIG AP CDN wish to express our appreciation to Mr Hiroshi Murakami and Dr John Dawson, the outgoing President and Chair of Geodetic Reference Frame respectively, for their support and co-operation. FIG AP CDN also hope to continue this strategic alliance with the new working group Chair Mr Miyahara and also Dr Barnicoat and the UN GGIM AP executive. As per usual the UN GGIM AP concluded its Plenary with meeting resolutions, and FIG once again was recognised as a working partner in the development of geodesy and geospatial information in Asia and the Pacific. Please note the next UN GGIM AP Plenary meeting will be held in Canberra, Australia 4-5 November 2019. In my capacity as the FIG representative (member) on the UN GGIM Subcommittee on Geodesy – Education, Training and Capacity Building (ETCB) working group I also participated in the annual meeting of the UN GGIM Subcommittee on Geodesy (UN SCoG). During this meeting, in conjunction with ETCB colleagues Ms Allison Craddock (USA, NASA – JPL), Mr Graeme Blick (New Zealand, LINZ), and Mr Mikael Lilje (Sweden, Lantmateriet and FIG Vice President), presentations were prepared and delivered with respect to the status, activities and plans of both the ETCB, and FIG AP CDN. ETCB members to consider a new ETCB questionnaire in relation to the barriers, why capacity building is needed, who requires capacity building, what capacities are required, and how these should be delivered and by whom. There were also several meetings held with the FIG Director Louise Friis-Hansen, and FIG Council members (both current and incoming), namely President Chryssy Potsiou, incoming President Rudolf Staiger, Vice President Mikael Lilje and incoming Vice President Jixian Zhang. The meetings were focused around the technical workshops and sessions at the upcoming Working Week in Hanoi, and enhancing FIG’s profile and engagement with potential Asian member associations and corporate sponsors.